When it comes to the ethics of medicine, we're going to get real - in the most dramatic possible way. We'll discuss actual case studies, examining many possible viewpoints as we come to grips with the issue that matters most: What kind of action - or inaction - should we take? When should we take it? And when do we edge too close to playing G‑d? Earn up to 9 MCLE credits for this course, including ethics (professional) credits. This class is also available for CME credits, for medical professionals. Contact us for more details. Class open to all. Medical and legal background not required. Couples undergoing fertility treatment are often advised to reduce the number of fetuses in order to save a high-risk pregnancy. May we end the life of one or two to save the lives of many? Is the fetus considered a life? This lesson discusses Judaism's view on the status of the fetus, and the ethics of choosing one life over another. I have had the very good fortune of taking several JLI courses over the last three years. The thought-provoking, educational, and mind-expanding nature of the JLI courses is unique in Jewish adult education. As an educator with thirty years' experience and an interest in our inner and outer lives, I cannot recommend these courses highly enough. While I do not consider myself an observant Jew, JLI has been a transformational journey for me, and I've enjoyed every course. The topics are always thought-provoking and lead to stimulating discussions that are fun and fascinating to analyze. 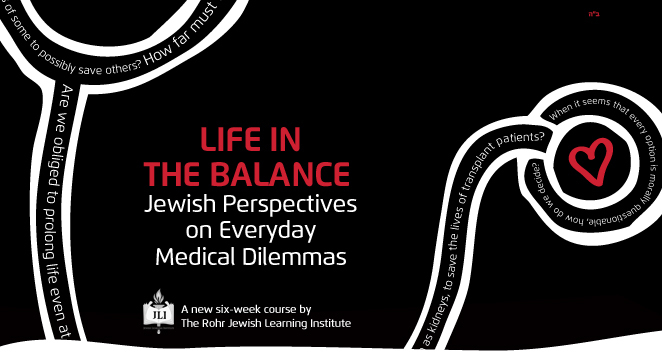 As our society continues to struggle with thorny and complex medical issues, from end of life to health care to abortion, the Rohr Jewish Learning Institute is continuing to offer fascinating courses that will shed light on these key questions and provide students of all ages with the all-important Torah perspective.